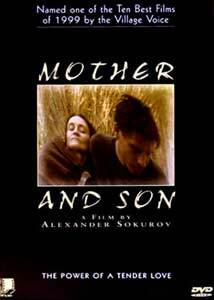 Russian director Alexander Sokurov's Mother and Son is a contemplative look at the relationship between an aged, ailing Mother (Gudrin Geyer) and her adult Son (Alexander Anaishnov). Son takes Mother for walks, carrying her through fields and forests, and they occasionally talk about memories and life in the isolated home they share. In this day and age, when many "art house" films are simply aimed at a more discerning audience than the typical cineplex fare, it's unusual to see a genuine "art film," created as an exploration of the form with no commercial or marketing consideration whatsoever. Mother and Son is not a conventional narrative movie, though there is a plot of sorts. It's more like a collection of paintings on film—Sokurov's camera hovers and lingers, with many shots running for several continuous minutes as Mother waits for Son's return, or Son carries Mother down a winding road among the grain fields under a cloudy, foreboding sky. An angular distortion technique is used throughout the film, stretching and tilting the image slightly to create a dreamlike quality. A couple of shots are actual, physical paintings, seamlessly integrated into the film's deliberately paced visuals. The film's storyline seems intentionally vague—we don't learn much about the unnamed Mother or Son, and are left to glean what we can from several brief dialogue sequences in the predominantly silent film. The effect is like a Henrik Ibsen play as translated by Samuel Beckett, all windblown isolation and pregnant pauses, the tale of a loving mother and devoted son huddled together against undefined threats from Outside. The film's comments on the human condition are well-considered but hardly revelatory, though strong imagery and a tremendously effective atmospheric soundtrack make them seem more profound than might otherwise be the case. Ultimately, Mother and Son is a collection of striking visuals constructed around the mother/son theme, held loosely together by a few threads of plot. It's the kind of film that can be experienced deeply or not at all, depending on the viewer's degree of investment and involvement. I didn't buy into its world completely, and I found it a bit monotonous despite its scant 68-minute running time, but director Sokurov's mastery of the medium cannot be denied. Image Transfer Review: Mother and Son is presented in its original 1.66:1 widescreen theatrical aspect ratio, with a nonanamorphic letterboxed transfer. The source print exhibits significant dust flecking in several scenes but is otherwise in good shape, though the digital transfer suffers from murkiness and blurriness when trying to handle complex detail, especially trees and billowing grain fields. The film's muted earth-tone palette of greens and browns is captured well, but the DVD doesn't quite do justice to the film's painterly visuals. Still, it's an improvement over most Fox Lorber discs I've seen and a step in the right direction for the studio. Audio Transfer Review: Fox Lorber presents Mother and Son in Dolby 2.0 surround audio format, and the film makes excellent use of the broadened soundstage. The film's soundtrack is dominated by environmental wind and weather, and the surround mix gives these elements considerable presence. Clear (if slightly hollow-sounding) dialogue, enveloping atmospherics and strong bass during thunderstorms combine to make this a superb audiovisual experience. Judging from this example, Russian filmmakers are welcoming Dolby Surround technology with open arms and creative ears, and the DVD sounds just fine, making up for some of the disc's image transfer shortcomings. Extras Review: Fox Lorber's Mother and Son DVD features a few supplements䃐 picture-menu chapter stops, Filmographies for the writer/director and both cast members, three screens listing cast, crew and DVD production staff, and a DVD-ROM Weblink to the Winstar Video website. I believe this is the first Fox Lorber disc I've reviewed where the English subtitles are implemented as a DVD subtitle channel rather than burned into the film print. There's no menu option for turning them off, though they can be disabled via the DVD remote; still, this is a significant quality improvement for those who speak Russian or would like to watch the film as a purely visual experience. Mother and Son is a beautifully constructed art film that plays more like a "moving picture" than a movie in the traditional sense. Fox Lorber's DVD features a passable transfer and a handful of supplements, but the film's appeal may be limited. Rent it before purchasing, but if you enjoy the film it will likely stand up to numerous repeat viewings.